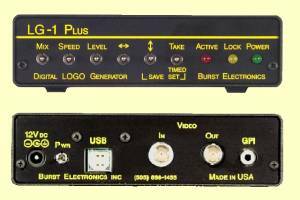 The Burst Electronics LG-4 Video LOGO Generator/Inserter is a video graphics overlay unit. The LG-4 imports a PC generated graphics file and overlays that graphics on composite video. The graphics can be a LOGO, text, ID, etc. The graphics are created using Microsoft PC Paintbrush for Windows or any other Paint program that creates a BMP (Bit Mapped) file. 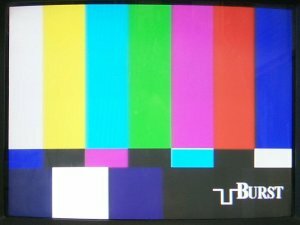 The graphics window is 256 pixels wide by 64 scan lines high and may be placed anywhere over the background video. One horizontal scan line is 750 pixels wide (70 nS pixel resolution). The overlaid graphic image is adjustable in brightness from 7.5 IRE black to 100 IRE white. The timed take feature allows the logo to appear at user selectable preset time intervals. There is also a GPI trigger for additional flexibility and remote control operation. The LG-4 has an internal mixer and keyer with fade and intensity control. This allows for a smooth up/down transition of the overlaid graphics. Additionally, the transparency of the graphics can be adjusted to suit the background program material. Imported graphics are stored in a non-volatile EEPROM memory; this allows retention of up to four graphic images with power off. The four stored logos may be recalled via front panel control or PC. A USB 2.0 interface is standard. A Windows program is provided to load the graphics files into the LG-4. The LG-1 Plus is identical to the LG-4, but with non-volatile storage of only one logo. Follow $ symbols to price list. GPI:	External trigger (Ground or TTL low) 50 ms min.